Maven is an American company based in Lander, Wyoming who design and create high end binoculars and spotting scopes as well as a good selection of related accessories like cases, bino harnesses, tripod adapters and cleaning kits. 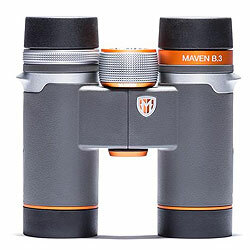 Somewhat unique to the optics industry is that Maven supplies their products direct-to-consumer (either on their website of I have seen that they have an outlet on Amazon), which is what enables them to produce such high performance optics that are comparable to the big European brands without the usual (typically around 50%) retail markup. 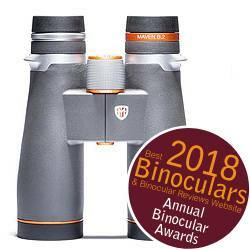 A service that Maven offers and one which sets them apart from most other brands out there is the ability to personalize (#bling) your binocular. So you can't choose which optical components and coatings you'd like, but you can decide the color of a number of accents on the body, choose the body color and have your name engraved onto it should you wish. Obviously you do have to pay for this service and depending on each individual build and your specific requirements, delivery is said to take up to four weeks after you have submitted your design, so this is something to keep in mind. 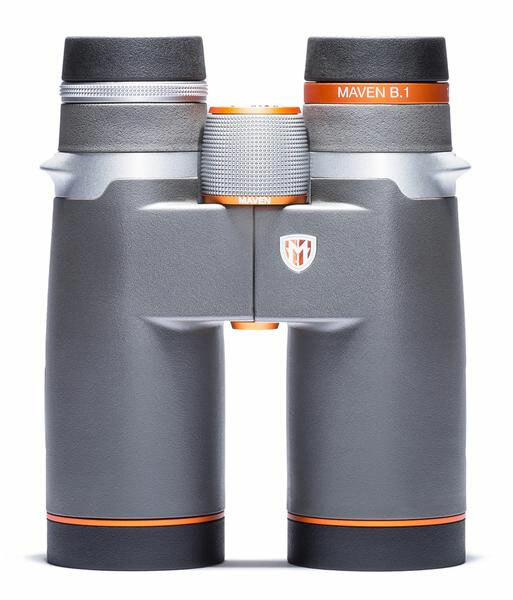 Of all the Maven Built ranges, the B1 would be classed as their "standard" full-sized series as both models use 42mm objectives. The objective lenses comprise of 3 groups with 4 elements that includes an ED (extra-low dispersion glass) element designed to reduce chromatic fringing. 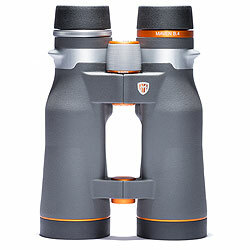 Both the 10x42 and 8x42 models are available with either orange, black or silver color options. 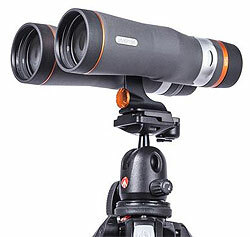 10x42 341ft 16mm 6.6ft 30oz 5x6.2x2.1"
8x42 388ft 18.6mm 6.6ft 29oz 5x6.2x2.1"
All Maven B2 binoculars use 45mm objectives and so whilst I would still classify them as being full-sized, it does make them a little larger than those with 42mm objectives. 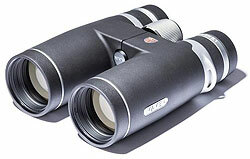 The main positive aspect to these larger lenses is that they let in more light. 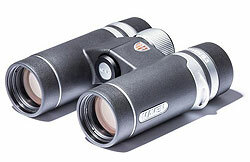 This enables them to offer a better quality image and perform better in low light. Like the B1 series, the larger 45mm objective lenses on all models within this series are made up of 3 groups with 4 elements which also includes an extra-low dispersion glass (ED) element for helping with chromatic fringing reduction. A difference to the B1 series are that Abbe-Koenig roof prisms are used in this B2 series and not the Schmidt-Pechan design. Abbe-Koenig prisms are longer and thinner (less compact) and I have read that their long focal length is said to be superior in reducing some aberrations. Another important difference is that all surfaces reflect 100% of the light and so a Abbe-Koenig prism does not require the use of costly highly reflective coatings like Silver or the Dielectric ones used on the B1's above to improve the internal reflection. The chassis on the B2 is fashioned from Magnesium, is tripod adaptable, fully sealed and filled with nitrogen for fog protection. The are also water proof tested at 1 meter for 30 minutes to gain the same IPX7 standard as the B1. 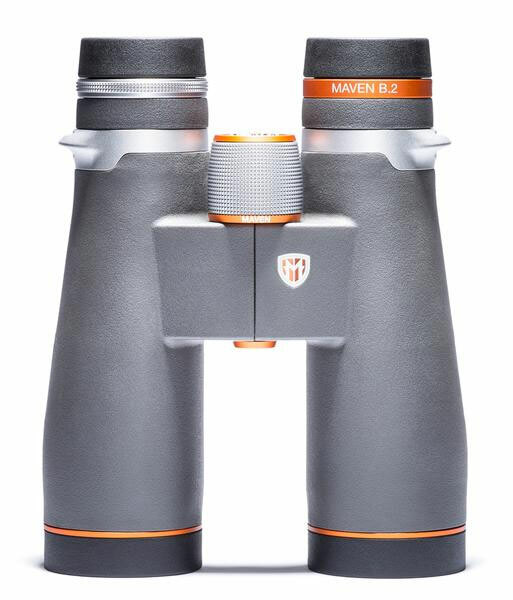 Like the other Maven Built ranges, you can get the Maven B2 binoculars with either orange, black or silver accents. Below are some of their main specifications. 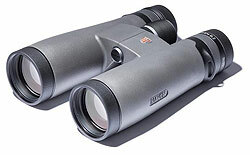 For more, be sure to check out my full Maven B2 11x45 Binoculars Review. 7x45 388ft 18mm 6.5ft 33oz 5.7x7.1x2.2"
8x45 377ft 17.3mm 4.9ft 33oz 5.7x7.1x2.2"
11x45 314ft 16.7mm 4.9 33oz 5.7x7.1x2.2"
With 30mm objective lenses, the B3 series from Maven is their mid-sized option and ideal for those looking for a more lightweight and easier to pack device. 6x30 446ft 18.3mm 8.2ft 16oz 4.7x4.6x1.7"
8x30 430ft 15.1mm 8.2ft 16oz 4.7x4.6x1.7"
10x30 341ft 15.3mm 8.2ft 16oz 4.7x4.6x1.7"
The big daddy series of Maven Binoculars. B4 models are large instruments with 56mm diameter objective lenses. Perfect for improved light gathering, which enable bright images even when higher magnifications are used, so perfect for high quality long distance observation. 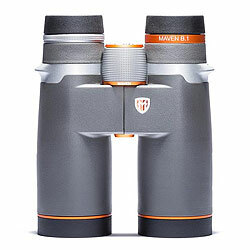 Large 56mm Objective lenses, which include extra-low dispersion glass (ED) elements arranged into 3 groups with 4 elements. Like the B2 series, these large B4's use the Abbe-Koenig roof prisms. This design pis longer and thinner (less compact) than the Schmidt-Pechan ones and I believe that they have a superior long focal length and more surfaces reflect 100% of the light and so on longer, more powerful bins like these can perform better. These roof prisms also have the very best dielectric coatings on the surface that does not naturally reflect 100% of the light. 10x56 351.8ft 17mm 9.8ft 48oz 6.1x8.2x2.7"
12x56 288.8ft 18mm 9.8ft 48oz 6.1x8.2x2.7"
15x56 231ft 18mm 9.8ft 48oz 6.1x8.2x2.7"
New from Maven and amongst some of the highest specification compacts on the market are these C.2 Compact binoculars. 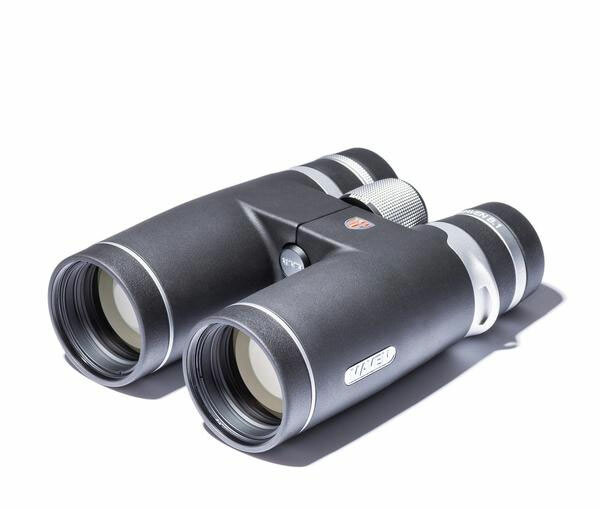 Not only do these Maven C2 binoculars have ED glass lenses (which is rare on a compact), but come with fully multi-coated optics, phase corrected prisms and the very best dielectric coatings on them for maximum reflectivity and thus the highest possible performance. 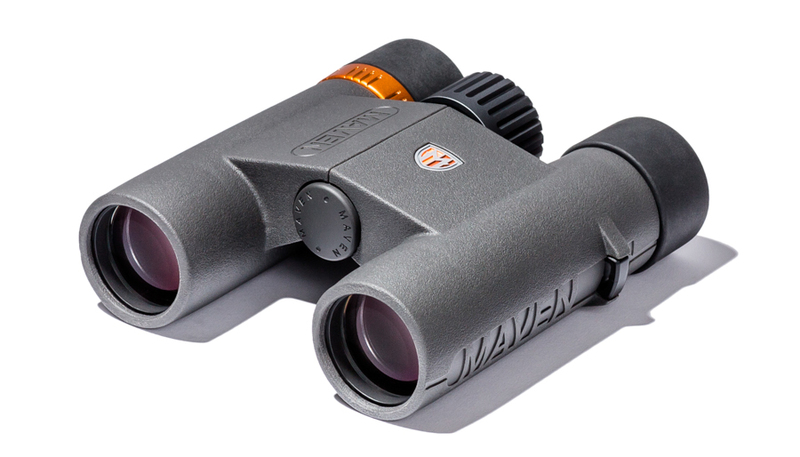 In addition to this, Maven C.2 Compacts also have protective coatings added to the exterior lenses, are fully fog and waterproof and protected by a lightweight polycarbonate shell. The Maven C.2 binoculars come in two configurations, the 7x28 with it's super wide field of view and large exit pupil for great low light performance and the 10x28 for those who's main requirement is to get closer to the action. 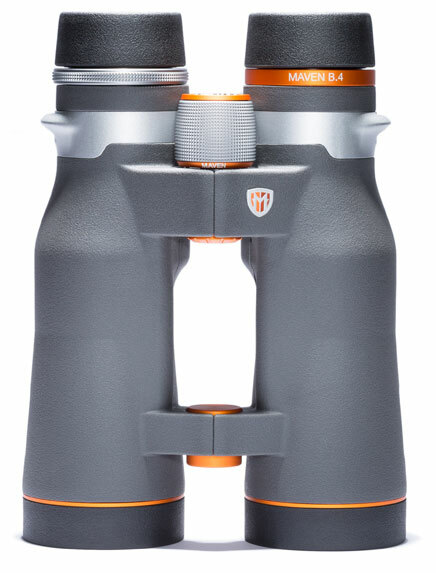 Below are some featured and fully reviewed Maven Binoculars: View >> All the Maven Binoculars that I have reviewed.